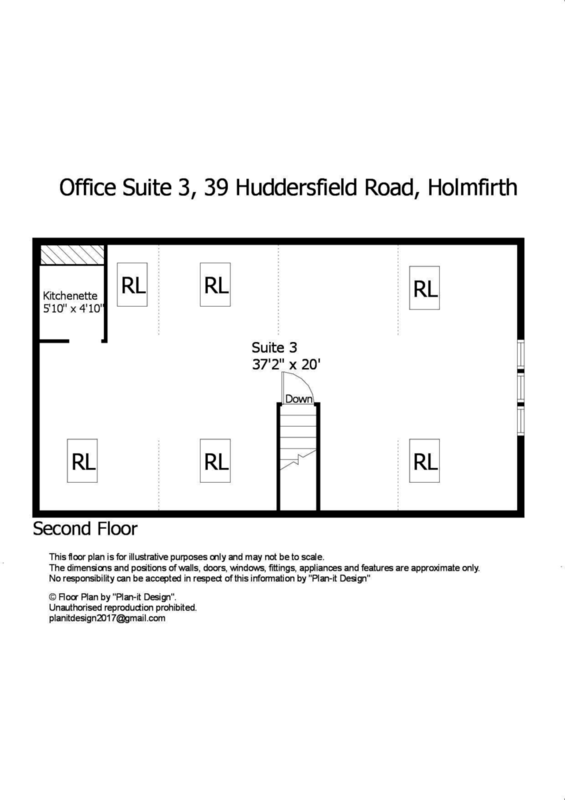 Occupying the entire upper floor of the this recently converted building in the centre of Holmfirth. It is open plan with a small kitchenette in the corner of the room and exposed roof trusses and velux rooflights to the angled ceiling. There is also a characterful window to the gable end of the building, spotlighting and central heating. The office suites can be accessed from the rear of the building. A communal entrance door leads to a staircase to the first floor. There are also ladies, gents and disabled WCs located on this level. VAT at the prevailing rate (currently 20%) will be payable on top of the rent. A monthly service charge of £50 (plus VAT) is payable to cover general maintenance of the building, window cleaning, fire safety systems, CCTV and insurance. Should there be any surplus at the end of each calendar year, this will be refunded. Note that the landlord reserves the right to increase this figure to cover reasonable increases in the cost of the included services. Limited parking spaces are available at the rear of the building, by negotiation. The properties will be let on an Internal Repairing and Insuring (IRI) Lease. The tenant will be responsible for the internal maintenance and upkeep of suite. The tenant will also be responsible for business rates Â– we advise small business tenants to investigate whether they would qualify for small business rates relief. The property is heated by a communal gas central heating system which is shared with the 3 office units above. The tenant of each unit will be billed by the landlord for usage on a pro rata basis which is calculated based upon the gross internal floor area of each unit. Electricity is provided on a shared supply with each unit separately metered. The landlord will bill for electricity usage quarterly based upon the meter reading. The equivalent of a months rent is to be paid upon commencement of the lease in addition to the first months rent. By appointment with Wm Sykes & Son.